If you live in the Lucchesia you don’t have to go all the way to Tibet to cross a Tibetan bridge. 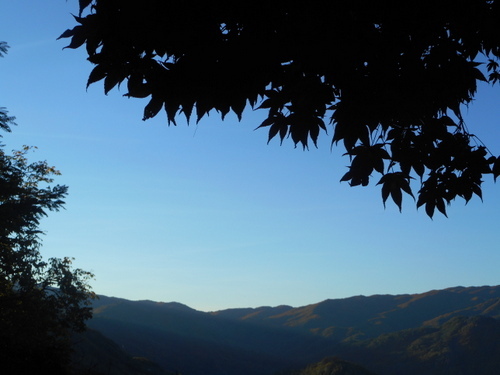 Since the summer this year you only have to go as far as Lake Vagli which is reached on the road leading left from Poggio, north of Castelnuovo di Garfagnana. I love the thrill of highly strung pedestrian suspension bridges and, of course, we have our own in Val di Lima which I’ve described at https://longoio2.wordpress.com/2014/07/24/ravioli-and-suspense-in-val-di-lima/ so I was keen to try out the new one at Vagli. In Tibet suspension bridges are usually made of strong chord and are used to provide a short cut across the many deep valleys of that country divided by such rivers as the Mekong and the Brahmaputra which originate in the Himalayan snows before descending into the plains of India and Indo-China. There are already two bridges in the Vagli valley plus the dam that was built shortly after the last war to provide hydro-electric power and drinking water for Pisa and Livorno by blocking the river and forming a large lake which effectively encircles Vagli di Sotto. Vagli’s mayor thought it would be a good idea to add a third bridge to carry across a mountain trail and provide an added frisson for ramblers in the area. 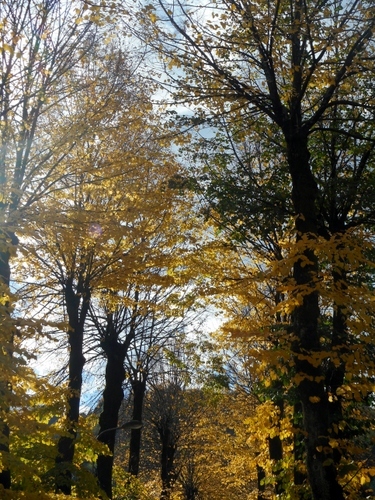 It was an idea which brought over two million visitors to the area in summer. Such was the demand to see and cross the bridge that crossing it had to be restricted to visitors just for the week-end. So it was a bit of a disappointment when I reached the bridge on a Thursday and found the gate to the lakeside path leading to the ‘ponte Tibetano’ closed. Fortunately, I had two allies in my side. First, the lake of Vagli was practically dry. Because of the lack of summer rainfall most of the inhabitants of Pisa and Livorno had drunk its contents! In theory it would have been possible for me to get down towards the lake bottom and thus circumvent the fence. Then I met two kindly officials who said that since I’d come all this way to cross the bridge I could, with their approval, carry out my plan. The scene before me was totally spectacular – one of the most astonishing days I’ve passed for a long time. The almost emptied lake was breath-taking with its grey, lunar-like, landscape and I could make out some of the old buildings and roads and bridges which would have led to the now submerged village of Fabbriche di Careggine. The lake had last been emptied for maintenance in 1994 – a sight I’d experienced (see my post at https://longoio2.wordpress.com/2015/08/15/the-exquisite-alpeggio-of-campocatino/ on that supernal experience). There were promises that the lake would be emptied this year but because of the water shortage the importance of having some sort of reservoir was essential. Reaching the bridge I approached a monument park and was particularly moved to see that the wonderful dog Diesel, killed by islamists terrorists last year, was commemorated by a marble statue to him with the words ‘honour and respect’ inscribed on it. To read more about Diesel and other heroic dogs (and cats) see my post at https://longoio2.wordpress.com/2016/06/22/of-simon-the-cat/. The bridge, itself is a political statement for it honours the naval squadron of which the two Italian Marò (marine fusiliers) so wrongly accused of the murder of two Keralan fishermen in 2012 and who are still undergoing the almost unbearable stress of a legal case (I know I’ve been through one in my own minor way). Crossing the bridge was one of the most incredible experiences of my life. Quite alone, hundreds of feet above an almost dried-up lake I crossed to the other side witnessing the most wonderful views of the Apuan Mountains around me. I returned to Vagli without missing the ancient mystique of the Romanesque church of Saint Augustine. Vagli di sotto is itself a charming, quiet place with a beautiful marble and stone striped parish church and silent alleyways whose main inhabitants seemed to be a variety of cats. Vagli di Sotto’s Tibetan bridge is less dippy than the one in Val di Lima and its foot-walk is made up of wooden slabs rather than reticulated steel plates so it’s quite possible to take a dog across it provided, of course, that the owner doesn’t suffer from vertigo! If you go there aim for a week-end and don’t expect to see the lake as dry as I found it. Within twenty days I was told it’ll be full again. Which reminds me – we have no water to our house today unless we go down to the stream! The indefatigable Marco Nicoli, journalist for ‘La Nazione’, event organiser, founder of the Mammalucco cultural association and general all-rounder, in collaboration with the comune of Borgo a Mozzano, presented an evening dedicated to the history, sights and people of Chifenti as part of the new ‘Borgo e Bellezza’ series of events. The great symbol of Chifenti is, of course the Ponte delle catene, the chain bridge designed by the great Nottolini who went to England to study engineering with none other than Thomas Telford. The event was on the Chiffenti (south side of the extraordinary bridge, one of Italy’s greatest nineteenth century engineering feats. The show consisted of reciters, the great Walter, ex-barber of Ponte a Serraglio on guitar, a big screen and some splendid lighting (when they finally got it to work). Chifenti’s history dates back to the ancient Etruscans and Ligurians. Of mediaeval remains there are traces of a castle on the hill above Chiffenti where the original settlement was located. The construction of the Brennero road brought Chifenti down from its original hilltop location to line the important route north. Eventually, after the washing away of the old stone bridge built by Castruccio Castracani ,and dating from 1317, the pioneering chain bridge was commissioned in 1840 by Carlo Ludovico from Lorenzo Nottolini who’d travelled to the UK to study the construction of the Clifton Suspension bridge in Bristol and Hammersmith Bridge in London. Badly damaged by Gerry, the bridge was restored in 1953 at which time it was open to all traffic whether vehicular or pedestrian. (Now you dare drive a car, or even a scooter, across it!). Chifenti centre now became that familiar piazza known as piazza del ponte d’oro (square of the golden bridge) so-named because the new bridge cost a small fortune to build. 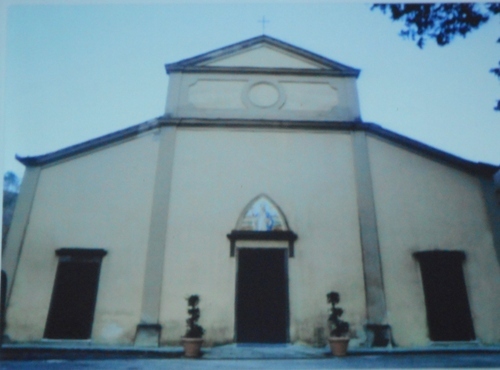 The speakers were all excellent with the unflagging Morena Guarnaschelli reciting the part of Mrs Stisted whose husband encouraged the building of the Anglican Church, now library, at Bagni di Lucca. Mrs Stisted’s reminiscences were fascinating. She remembered logs being floated down the Lima tied together into rafts which became thus both transport and merchandise. In those days it was the only way to transport huge tree trunks down-river to supply the ports of La Spezia and Livorno in the building of their ships. The job of manoeuvring the rafts down the river was both a specialised and a dangerous craft. Chifenti church was also described in some detail. Recently restored, it has some beautiful features like the tabernacle for the holy oil made by a pupil of the great Lucchese sculptor, Matteo Civitali. And then on to more recent times. Characters from the world of sport and commerce made an appearance, many of them remembered still today when the Piazza was filled with shops and industries and was a true social life hub. Happily, the bar Tintori together with some shops (flower and gardening outlets, one of whom supplied nice floral displays for the evening) still exist but they are but a faint recollection of what the piazza once was like in terms of activity. It was a great little evening beautifully presented (once the technical difficulties wreaked by the thunderstorm had been sorted out) and was a wonderful example of how a community can come together and present entertainment and instruction in a lively and fascinating way. Well done to all concerned. It was a truly memorable very well attended evening and we hope one of many more to come. This is truly what our community needs! The programme continues. 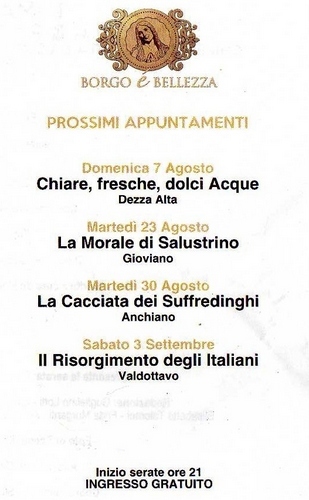 Here are future appointments. Don’t miss them! One could write so much on our area’s bridges. 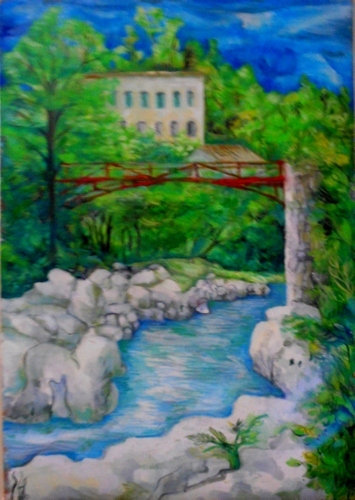 The Ponte Del Diavolo (more appropriately called Ponte Della Maddalena) is, of course, the most famous example of bridge building in the area and is a veritable gateway to the upper Serchio Valley. Built by command of the great ruler Countess Matilde di Canossa it dates back to the 11th century. 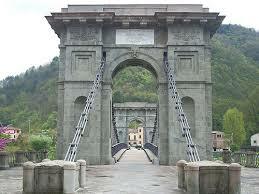 Bagni di Lucca’s Ponte delle Catene is probably Italy’s first suspension bridge. Designed by Nottolini in 1840 it was finally completed in 1860. 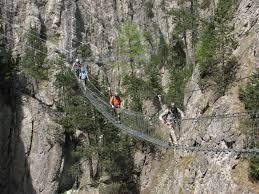 Sadly, many bridges were destroyed by retreating German forces in World War II. 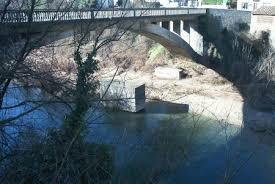 There used to be, for example, an ancient bridge at Calavorno but only a part of its ruined piers remain today. 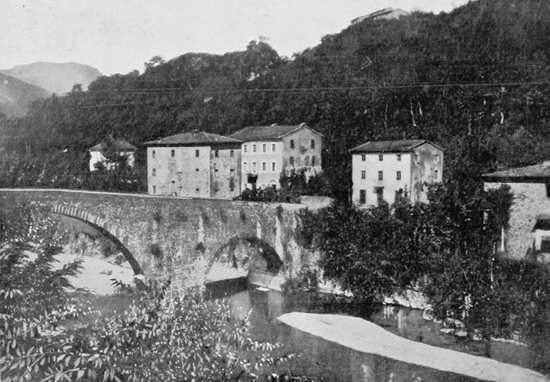 I’ve managed to find a photograph of the old bridge in a book by Arnaldo Bonaventura published in 1913 as an illustrated monograph in a series entitled’ Italia Artistica’. 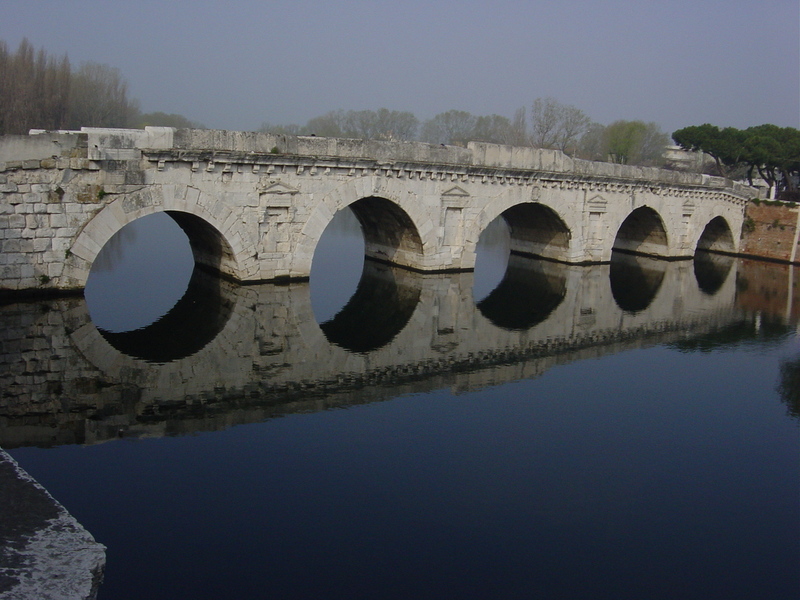 The ‘Ponte a Calavorno’ was one of the oldest bridges spanning the Serchio. Dating from 1376 it was built by the Orlandinghi, feudal lords of Loppia, who were patrons of the old Ospedale (or traveller’s hostel) of San Leonardo in Calavorno. Its two arches of different sizes recall a little the very disparate arches of the Ponte della Maddalena. Happily, however, there are still many old bridges remaining in the valleys leading off from the Serchio. 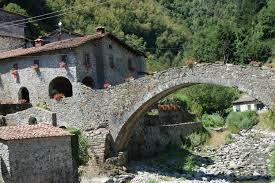 The pretty one at Fabbriche di Vallico is the best known of what in England would be called a pack-horse bridge. From spring-time onwards it’s decorated with overflowing geraneum boxes. Just past the artificial lake on the left side of the road leading to Fabbriche to Vallico in the Turrite Cava valley is a further example of packhorse (or packmule?) bridges. Known as ‘il pontaccio’ the bridge crosses the Turrite Cava stream and gives its name to the nearby small community (which also boasts a restaurant ‘Il Laghetto’ serving some of the best wild boar I’ve come across). 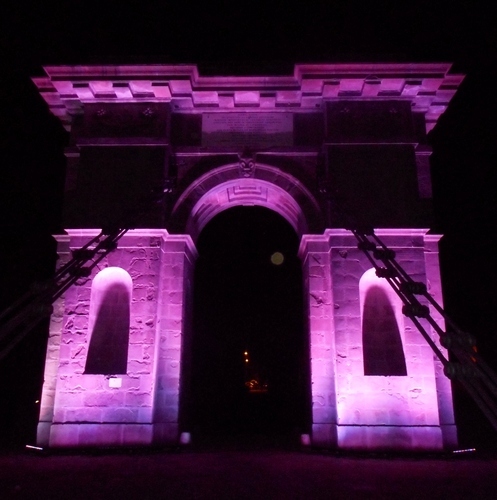 It’s an arched bridge which had become somewhat dilapidated but was expertly restored in 2004. The arch is 36 feet in span wide and reaches 16 feet at its highest point above the stream. The road across the bridge is 5 feet wide. It’s thought to date from at least the fourteenth century and is built with stones from the stream itself. Il pontaccio may look a picturesque but humble little bridge. However, it once served a very important role in linking the old state of Lucca with the Garfagnana territories ruled over by the Estensi family. Goods were traded between the two countries over this bridge. At this moment, when the frontiers of Europe appear to be clamming up against each other, bridges of all types have assumed a particular importance. After all, bridges are the first things to be blown up in hostile situations – bridges between people, communities and countries. We should be grateful; therefore, that il Pontaccio was spared to survive to this day as a symbol of unity and strength. Since I landed in this part of the planet eleven years ago three new bridges have been built in our area. 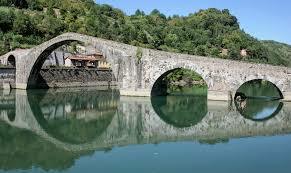 They are the bridges that cross the Serchio at Fornaci di Barga, Pian di Coreglia and Rivangaio. A fourth one is planned across the same river to link up with the new hospital at San Luca and avoid having to go into town – a sort of northern by-pass in fact. Not bad going but one must consider that Italy is, indeed, a nation that truly invented bridge building starting with the Roman arch. Who Was Matilde Di Canossa? 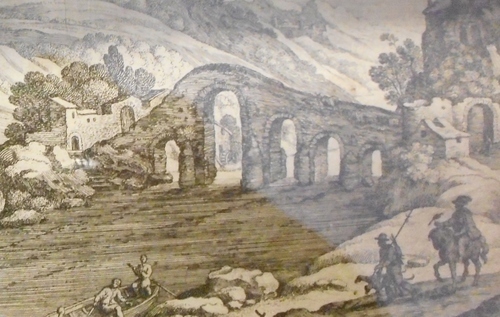 Those who have crossed the amazing Ponte della Maddalena (more colloquially known as the ponte del Diavolo – see my post on it at https://longoio2.wordpress.com/2014/09/24/river-diversion/) near Borgo a Mozzano will realise that the old story of the devil requiring the heart of the first living soul crossing the bridge if he completed it on time (and getting a dog’s heart instead) – a story oft repeated in many other parts of the world such as Pontarfynach (Devil’s bridge) near Aberystwyth in Wales – isn’t quite correct! In fact, the bridge was ordered to be built by an extraordinary woman, someone even more astonishing considering she lived at a time when women were usually still considered as chattels – the Countess Matilde di Canossa. She built the bridge as a means of helping travellers across the Serchio river along the Via Francigena pilgrim route which connects Canterbury with Rome. 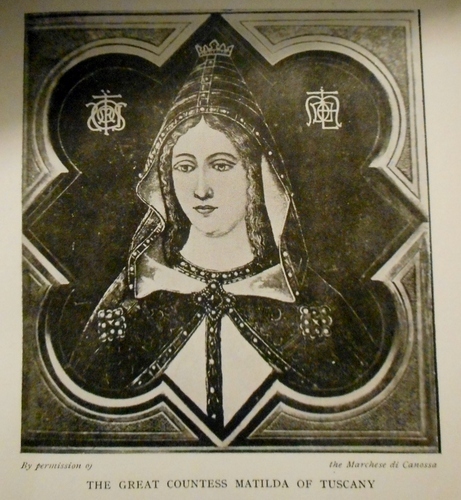 Matilde di Canossa is to be placed among that divine hierarchy of mediaeval women which includes Hildegard of Bingen, Berengaria of Navarre and Eleanor of Aquitaine. 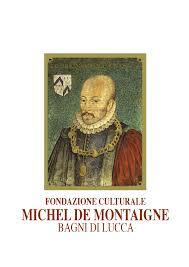 The fact that Matilde is closely associated with our part of the world is an added bonus and a good reason to dedicate a study afternoon to her by the industrious Fondazione Michel de Montaigne, the historical and cultural association which operates within the comune of Bagni di Lucca. 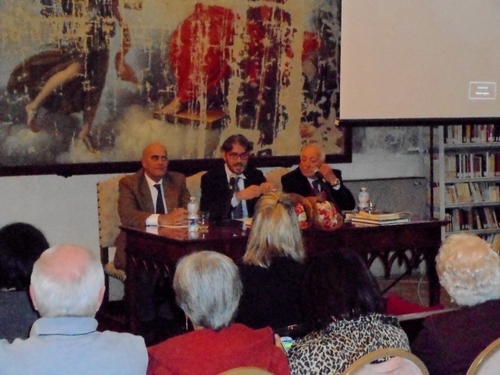 the conference was opened by the chair, Bruno Micheletti vice-president of the Fondazione and director of our section of the Lucca Historical association. 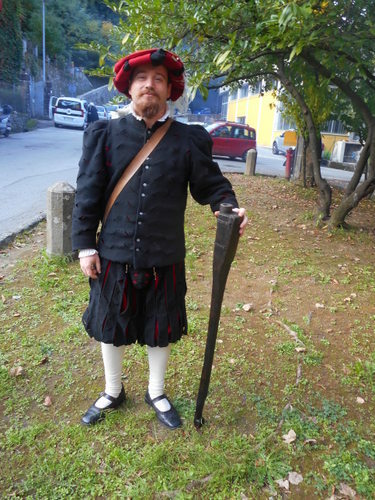 There were prefatory remarks by the Mayor of Bagni di Lucca, Massimo Betti. The president of the Michel de Montaigne Institute, Marcello Cherubini, then gave an introduction to the great figure that Matilde was. In case you didn’t know why Matilde is such an amazing mediaeval woman here’s a summary of her life. 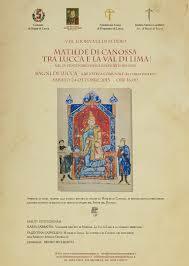 Matilde (in English, Matilda) was born in Lucca in 1046 and died at Bondeno Romagna in 1115. In 1076 she came into the possession of a large territory that included present day Lombardy, Emilia Romagna and Tuscany with its centre in the town of Canossa. 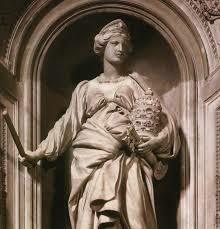 In 1111 Matilde was crowned as deputy Queen of Italy by the Emperor Henry III at the castle of Bianello. As grand countess of Tuscany, Matilde lived during turbulent times of battles, plots and ex-communications (Pope versus Holy Roman Emperor). Despite the age she lived in Matilde showed immense qualities of leadership, courage and compassion towards her subjects. Her father, Bonifacio of Canossa, was assassinated in 1052. With the deaths of her siblings Matilda was left as the only heir of the house of Attoni. In 1054 Matilde’s mother married Godfrey Duke of Upper Lorraine who hated the Emperor Henry III, who captured Beatrice and Matilde as hostages in 1055. However, after reconciliation with Godfrey the two ladies were released. Godfrey died in 1069 and Matilde married his son, Godfrey the Hunchback. They had one son who died in infancy. In 1076 her mother died and Matilde took the reins of the kingdom, siding with the Pope against the Emperor. 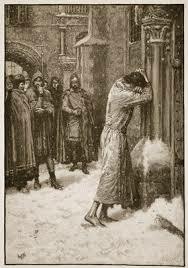 It was at Matilde’s castle at Canossa that the famous event took place in 1077 when Pope Gregory received the Emperor’s penance after making him wait three days, barefoot and bareheaded, in the castle courtyard’s snow, before giving the hypothermic Emperor the papal absolution. 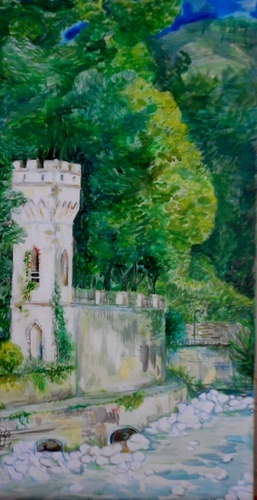 The phrase “going to Canossa” has since come to mean an act of submission or humiliation. In 1089 43-year old Matilde married 17-year old Welf, duke of Bavaria and Carinthia. Their marriage only lasted six years. Further conflicts occurred between Emperor and Pope but in the end Matilde signed a peace treaty with the Emperor gifting him her territories. Since she had previously donated these to the Papacy the way was set for the subsequent quarrels which, in Florence, became an irreconcilable battle between Guelfs and Ghibellines. The esteem in which Matilde was held was so high that her remains were translated and reinterred in St Peter’s Rome in 1634 where I saw this monument to her when our choir sang there last year (see my post at ). 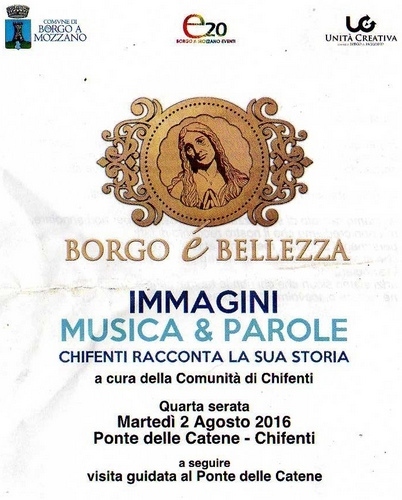 https://longoio.wordpress.com/2014/03/27/our-choir-sings-at-romes-and-the-worlds-greatest-church/ ). To this day Matilde di Canossa remains the only woman buried in St Peter’s basilica,. The second talk by Valentina Capellini concentrated on the documentary evidence relating to Matilde’s presence in Lucca’s diocesan archives. This was more of a specialised subject and, frankly, unless one was a devotee of bibliography, I felt it would be only of interest principally to specialists in the field. 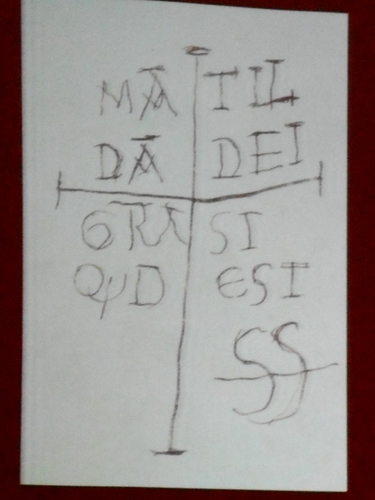 However, I was fascinated by Matilda’s monogram with which she would sign documents. The study afternoon was rounded off by an introduction by Tommaso Rossi, a brilliant young archivist who had organised an exhibition of documents relating to Matilde in three of the library’s showcases. The mediaeval parchments were, of course, just represented by photocopies. The books relating to the Countess and her subsequent elevation to a myth were represented by original examples. In the more modern section I was glad to find out that even I owned a part of the literature relating to the great woman as a copy of ‘ A famous corner of Tuscany’ by Evangeline Whipple (see my post mentioning her at https://longoio.wordpress.com/2013/06/29/some-corner-of-a-foreign-field/) was displayed.. The conference was incredibly well-attended with standing room only for some of the audience. 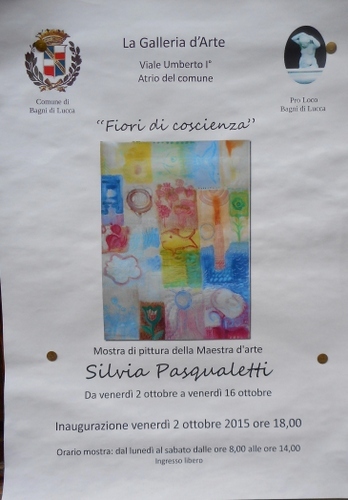 This is clearly a good sign as it shows increasing interest by Bagni di Lucca’s citizens in their local history. Well done to all those who pulled together to produce this fascinating study afternoon! ‘All that glisters is not gold – often you have heard that told’ as the message states in the golden casket, where the the Prince of Morocco expects to see his beloved, Portia’s picture but instead finds one of a skull. 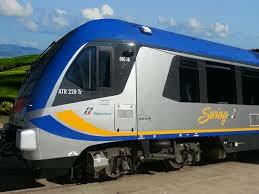 The first of the new ‘swing’ trains entered into service on our Lucca to Aulla line on 22nd March this year. 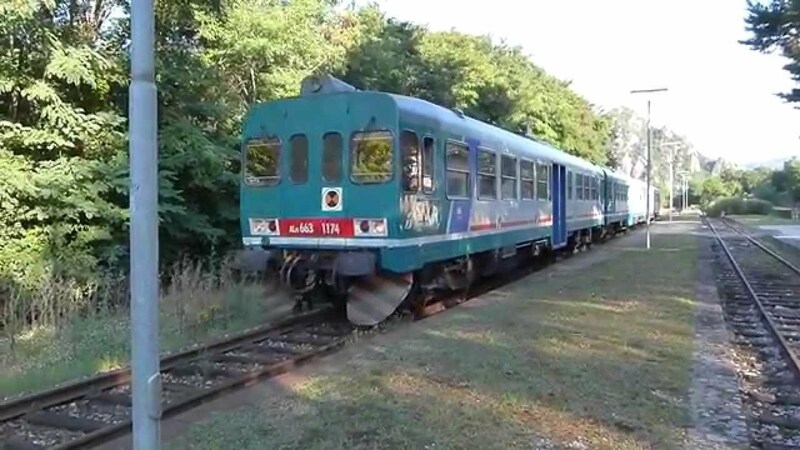 Built in Poland by the Pesa Company they are meant to replace the old FS ALn 663 class of trains which were getting a bit long in the tooth. Indeed, passengers often had to open their umbrellas on wet day as rain water would seep through the roof! Moreover, increasing mechanical problems were causing more and more late arrivals, departures and, worst of all, cancellations. 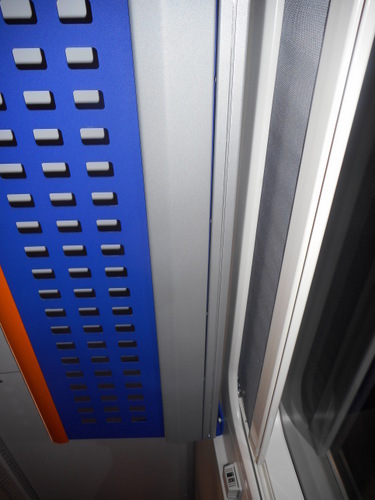 The new trains promised a new era in railway travel on our line which I would, in terms of the scenery through which it passes, count as one of the great train journeys of the world. Spectacular viaducts, stratospheric bridges, two very long tunnels and much else make this line (which was started in 1892 but only completed in 1959) also one of the great engineering feats of FS (Ferrovie dello stato) Italian state railways. Surely this line deserved the best trains to run on them? We’d hoped that the new era would descend upon us with the introduction of the ‘Menuetto trains’ some years ago. 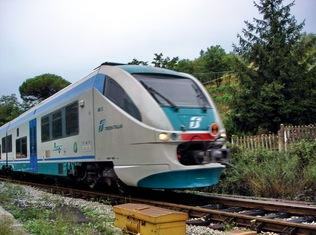 Built by an Italian form, Alstom, in their factory at San Giovanni near Milan the Menuetto gave us much hope. However, there were problems with loading gauge (some of the tunnels were not high enough), signalling and mechanical reliability. Again we were saddled with increasingly ageing FS ALn 663’s for several more years until the arrival of the ‘Swing’ diesel railcar (the electric version of this is called ‘tango’). Unfortunately, there have been major problems with the ‘swing’ trains too. First there are problems relating to the line in terms of signalling which have caused delays and even cancellations. Correct timing is essential on a single line railway and the delay in the arrival of the up train can clearly have severe effects on the down train too. Second, there have been problems with the actual carriages themselves. Doors have failed to open or close and in one case a door actually fell off. I was involved in one problem on a train journey to Aulla the other week. I’d just moved from one seat to one nearer the door when I heard an almighty crash behind me. I looked round and saw a steel bar on the seat where I’d formerly sat, one of its points impaling the exact position where I’d been! 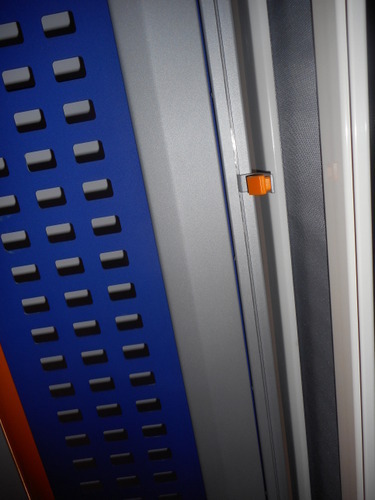 I discovered that this bar was a curtain rail on as it has sliding hooks on it (with as yet no curtains, as there were no curtains anywhere in the train to pull and protect aganst the summer sun). The bar had fallen from just above the window frame when it had been positioned. I’m not sure whether this was a one-off situation. I think however that one should be a little wary of where one sits in these trains and, certainly test the curtain rail beforehand! The subject manner varies from naïve naturalism to almost abstract geometry. 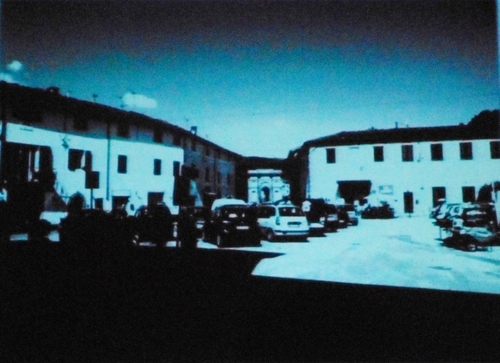 More recent efforts by Pasqualetti concentrate in the division of a painting into squares, rather like a sheet of stamps. Some of the images appear sadly haunting. I wonder what’s going on in the artist’s mind here. 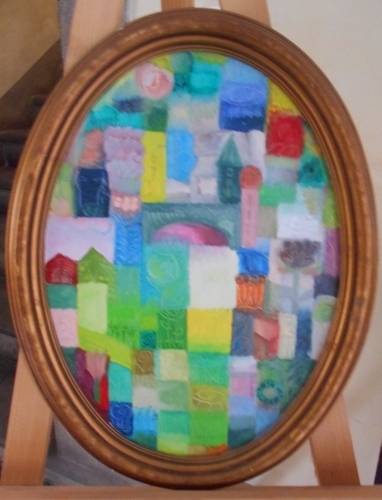 This most abstract of her canvases I find a little reminiscent of Delaunay in its kaleidoscope of colour. The poems accompany the paintings and are, in effect, verbal blueprints for the subjects depicted. It’s a pity that translations of them were not done as they might have cast more light on the paintings themselves.